Tonight, it’s a bottle of Goats do Roam, a wine I wrote about before. Supper is my Blog-on-ese sauce, on pasta, a sauce I wrote about before. I feel like an engine running on fumes. I can’t be out of material already! I’ve only blogged for over a year! There’s so much to say! Let’s see. What random thoughts can I share? For Christmas, my thoughtful husband, who knows I like to write, draw, and document, bought me a Moleskine Wine Journal. For those of you who can’t be bothered with documentation, art, and detail, (or have a life) this might be a good time to go find yourself a squeaky toy to play with. 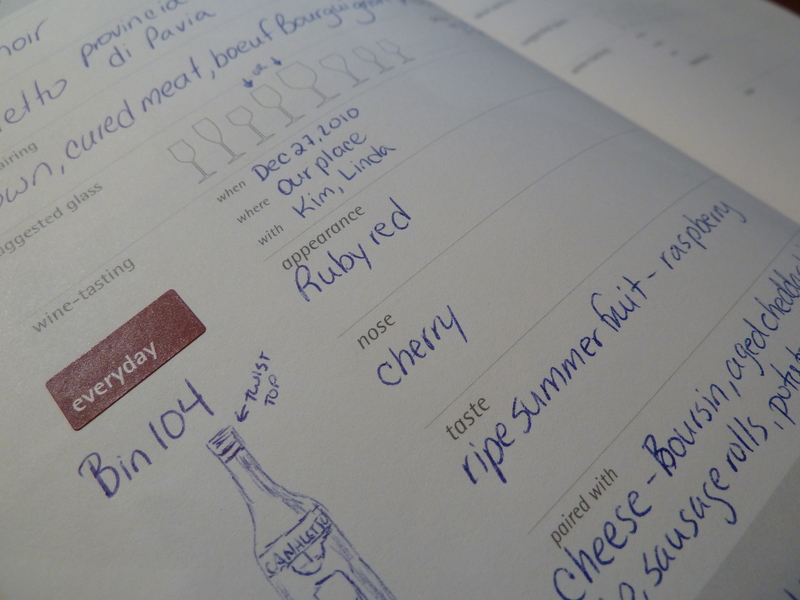 For the rest of you, the Moleskine Wine Journal allows a person both regimented pages of form filling – meaning, space to document a wine’s name, vintage, grape, alcohol percentage, pairing suggestions (which I’ve copied from the wine label), suggested glasses, appearance, nose, taste and suggested pairings (again, gleaned from the bottle). There is space to doodle, and doodling is something I completely love to do. As you can see in my picture, you will see my artist’s rendering of the bottle, complete with note about the screw top. What you don’t see is my childish drawing of Italy to show the region the grapes were grown. But wait! That’s not all…. Stickers in red and gray to match the wine colour (the gray is for the white wine for those who just lost their squeaky toy under the couch). 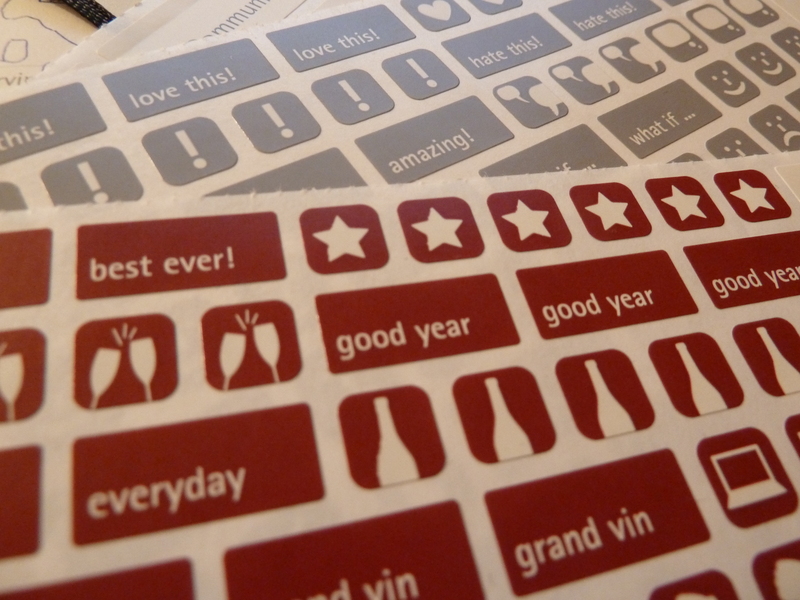 Stickers with hearts and exclamations, happy and sad faces, etc. etc. It is so much fun! It casts me back to days in the 1970’s when my parent’s would buy me a pack of stickers from the local Mac’s store after a swim class, to reward me for completing a class and a) not drowning b) not whining and probably c) keeping my bathing suit on while in the pool. The stickers back then said things like “Groovy” and “Cool” and were stuck on my binder covers, furniture and forehead. And as one old friend recognizes, there won’t be enough “best ever” stickers for me. I love my wine. So long as it isn’t corked (difficult to do with Goats do Roam on account of the twist top), and I don’t find a mouse in my bottle, I will drink it with zeal and much happiness. Next Post Made it to 44. Again. Speaking of wine, tonight we watched the movie “Bottle Shock.” I thought it was good, although I would have liked more Alan Rickman and less of those damn hippies. Get a haircut! I’ll have to look for this movie. I adore Alan Rickman. I’d invite him over to just talk to listen to his voice. He could discuss the life cycle of newts for all I’d care. (And yes Jenny, I’m still stuck on newts). I see it pairs well with Bousin! I have a GREAT recipe for homemade boursin – ask me for it sometime – fresh herbs and delicious!